This week I'm presenting an expression rather than a single word. The individual words in this expression are well known to me from the beginning of my French-learning experience. That was way back in the last century, like 35 years ago. Crikey. On Tuesday I went to the medical lab in town (laboratoire d'analyses médicales) for my annual blood work - cholesterol levels and all that. As usual, the technician couldn't get a good vein in my left arm, so he moved to my right. After one unsuccessful poke in the right arm, he had to change to a smaller diameter needle to actually get some blood flowing. After what seemed like a minute, I asked the technician if there was indeed any blood flowing - I don't like to watch - and he said yes, but since he was using a smaller needle it would take longer than normal. He looked at me and asked if I was ok. I was not. I felt incredibly light-headed and I told him, "j'ai la tête qui tourne" which means "I'm dizzy." The technician said we were done and immediately put my feet up and reclined my chair. He turned the lights off in the room and just told me to relax for a minute. I felt better very quickly, but I was really close to passing out. I told him that only other time this happened was the first - and last - time I tried to donate blood, nearly 27 years ago. That time I actually did pass clean out. So, what I told my French technician was, "La première fois que j'aie fait un don de sang, je suis tombé dans les pommes." I actually don't know how I knew that expression. It just came out, so I must have picked it up somewhere along the way. When I got home from the lab I had to look it up just in case. I was afraid I might have said something silly like "the first time I gave blood I fell head over heels in love." But no, I was ok; tomber dans les pommes (to fall into the apples) actually means to pass out, keel over. It still amazes me when a word or expression that I don't use in everyday speaking just pops out of my brain without my having to think about it. It makes me think that I'm actually learning something. I want to take this opportunity to thank Nancy Friedman for her gracious post about wcs' Word Of The Week on her blog, "Away With Words" this past Monday. If you haven't checked out her blog, please do. She writes about her adventures as a professional wordworker - she's a consultant in the San Francisco Bay Area who specializes in naming and branding for companies and organizations that are putting thought into their image. 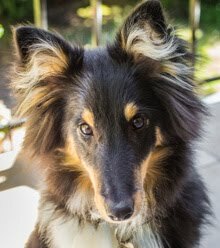 Her insight into language is unique, and she fills her posts with great links to other language related websites. Thanks Nancy ! Those of you who know us know that Ken and I have a small collection of corkscrews and cork pullers. These aren't heirlooms or anything of real value; in fact, it's not a collection, per se. It's more like an accumulation. Every home needs at least one way to get corks out of bottles. Even if you're not a wine drinker, the day will come when you will need to get a cork out of a bottle for some reason or another. A guest, a party, a special bottle of balsamic vinegar, something. So you buy a corkscrew at the supermarket. Then you learn that you got the wrong kind. A proper corkscrew has a worm (the curly part) that you can stick a pencil into (like the one in the photo above). A solid worm does not grab the cork well enough and can make a mess. So you go out and get a proper corkscrew. One day, you go on a picnic and forget to take your corkscrew, so you try to use the tiny corkscrew attacment on your Swiss Army knife, but all it does is push the cork into the bottle (yes, I've done that). Afterwards, you go out and buy a corkscrew to keep in your car. The next year you are traveling in Europe and want a bottle of wine in your hotel room. You have to sheepishly ask the front desk clerk to borrow a corkscrew because all the stores are closed, or, if you don't have the nerve, you use your Swiss Army knife to push the cork into the bottle (I've done it more than once). When you get home you go out and buy a corkscrew to keep in your travel kit, right next to the shampoo. Then someone gives you a nice quirky corkscrew for your birthday. Isn't it cute ? The first time you try to use it, you end up pushing the cork right into the bottle. 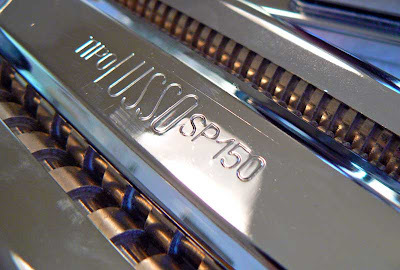 That tool goes into "the drawer" - that drawer we all have; you know the one. The next week you're out wine tasting and you see a cork puller in the winery shop that strikes your fancy and you say, "Hey, I want that !" And you buy it. It says "Joe's Winery" in big bold letters on the side. It also ends up in "the drawer." You have your favorites. You use them in rotation, until you find another that you like better. The others come out now and then, and you don't know how you ever lived without that one in your suitcase. My current favorite is a "waiter's friend" that I bought at a Hudson Valley winery last fall during our US trip. It's got a soft rubber grip, a terrific worm, and is strong and sturdy. How many times in your life can you write a sentence like that ? In our house, we open at least one bottle of wine each day, so our cork pullers get a workout. Some have been retired after years of faithful service, others are broken but we don't have the heart to toss them out; too many memories. So they accumulate. We love them all. We move on now to Chinon, a larger town on the Vienne River. Here, the ruins of a 12th century fortress dominate the river valley. 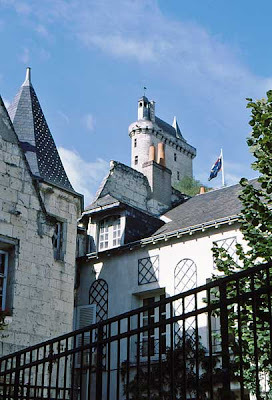 Many of the castle buildings still stand and can be visited, including the Tour de l'Horloge (clocktower) and the Donjon du Coudray. The Tour de l'Horloge towers above the town of Chinon. Chinon, the town, is a wonderful place to wander around in. It's sandwiched in between the flanks of the plateau on which the castle sits and the river below. It's much less touristy a place than Azay, with shops, restaurants and cafés, and a weekly market that serve the local population (les Chinonais). Chinon seen from the château. 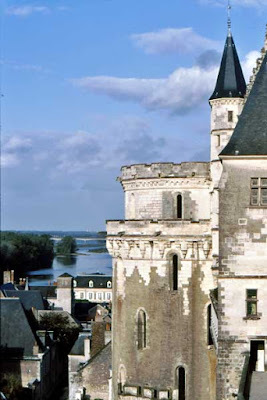 While Chinon was originally a gallo-roman stronghold, the fort and castle that are there today date from the time of King Henry II Plantagenet, king of England in the 12th century. This part of France then belonged to England. Henry and his second wife, Eleanor of Aquitaine, are buried not far from Chinon at the abbey of Fontevraud. 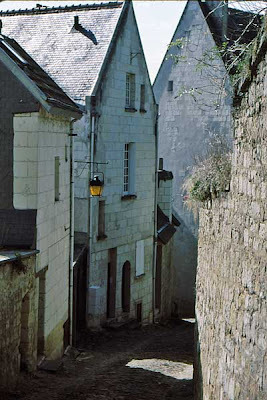 Small streets in Chinon make their way up to the fortress on the heights. Two of their sons, Richard the Lionhearted (Richard Cœur de Lion) and John Lackland (Jean sans Terre), each made Chinon their base of operations when they succeeded Henry as king. The Hollywood movie, "The Lion In Winter," starring Peter O'Toole and Katherine Hepburn, was set in and filmed partly in Chinon. The Vienne River at Chinon. In addition to its château and historic town, Chinon is a well-known and respected wine region of France. 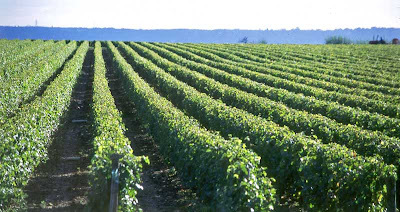 The principle varietal grown in the area is cabernet-franc. Apparently the ancestors of this grape were brought to the region by the romans, and it was widely cultivated in the area during the time of Henry II Plantagenet. 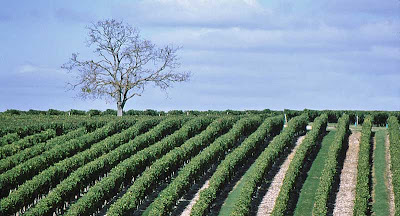 A Chinon vineyard on the higher banks of the Vienne valley. Ken and I have made several special trips to the Chinon area to buy wine since we moved to the Loire region in 2003. It's a great day trip for us that includes lunch (summer picnics are fun), a little sightseeing, and tasting before we buy. 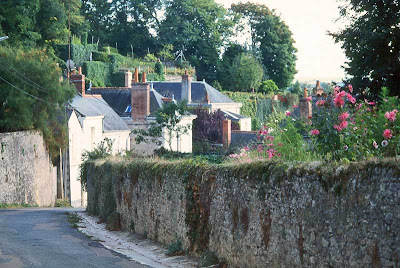 By the way, I forgot to mention a few posts back that the inhabitants of Amboise are called les Ambaciens and the people of Vouvray are les Vouvrillons. Most of my information about these places comes from the Guide Michelin. The photos are mine (shameless plug). 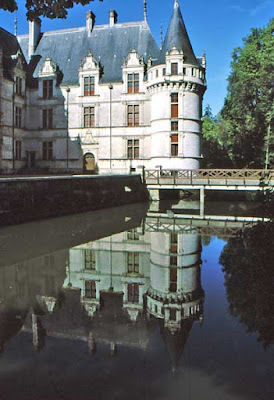 One of the turrets at Azay is reflected in the moat which is actually part of the river Indre. Just to the west and a bit south of the city of Tours, on the Indre river (a tributary of the Loire), is the town of Azay-le-Rideau, home to a very pretty renaissance château. In fact, the castle is built right on the river, which is dammed and controlled to produce a calm reflecting moat around the building. The castle sitting in its reflecting moat. The castle is set in a verdant park just adjacent to the center of town (where you'll find shops and places to eat). 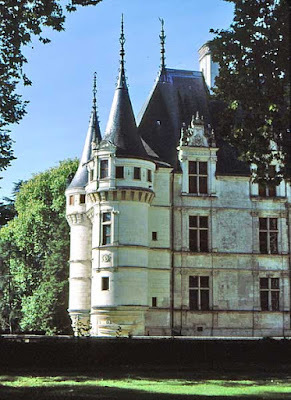 The current building was built in the early 16th century, but the place originally belonged to a knight of King Philippe Auguste named Ridel d'Azay. 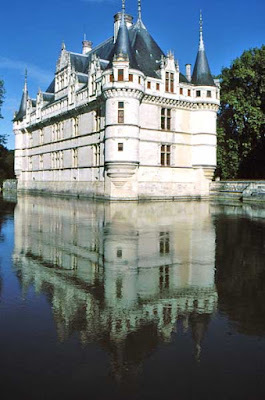 The whole place was burned in 1418 by Charles VII and was called Azay-le-Brûlé (Azay the Burned) until the 18th century. 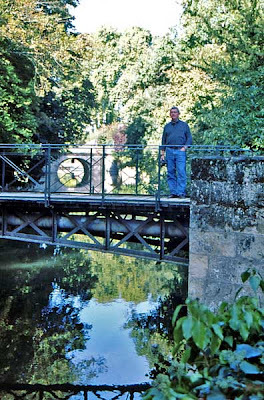 Ken poses on a bridge in the parc du château. 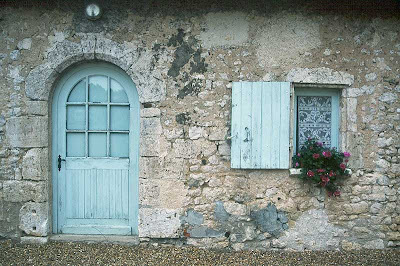 The people who live here are called Ridellois, recalling the name of the original lord-owner. In my opinion, the place is very pretty, but a bit too pretty. The town is touristy and expensive and the feel is more like Disneyland than a real place with a history. Another view of le château d'Azay-le-Rideau. The château and its grounds at Amboise are perched on a bluff overlooking the town and the Loire itself. If you pay the entry fee to meander through the castle, you won't be disappointed. 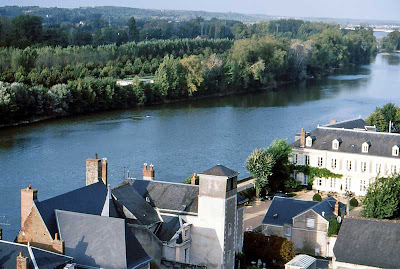 The Loire river seen from the château. What looks like the other river bank is actually an island in the middle of the river. The main royal logis building is open to wander, although it's pretty much empty. What furnishings there are are sparse; you have to use your imagination to conjure up visions of the royal court in residence. But that's not too hard to do. 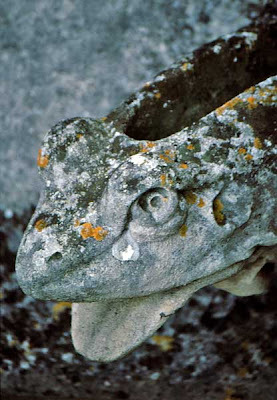 One of countless gargoyles that adorn the château's ramparts. Outside, the grounds and gardens are meticulously tended and on a warm calm day, you can spend time strolling and taking in the views. 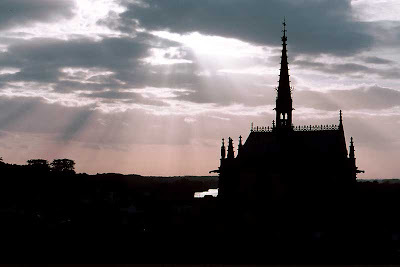 The silhouette of the Chapelle St.-Hubert, a gothic jewel. There's also the gothic chapel of St.-Hubert, built right into the wall above the town. The remains of Leonardo da Vinci are presumed to be entombed under the chapel's transept. Da Vinci spent his final years in Amboise (you can visit his home there) in the service of King François I. Back to our Loire Valley trip in the year 2000. You'll remember that we were based in Vouvray. 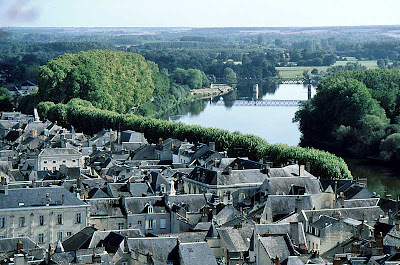 Very close by, back up the river a bit, is the town of Amboise which boasts a terrific château up on the heights. The Château d'Amboise perched high about the Loire River. It was in 1492, when Columbus set sail for the new world, that Charles VIII of France started construction to expand the original buildings on the site (where he spent his childhood) into the castle we see today (or what's left of it). 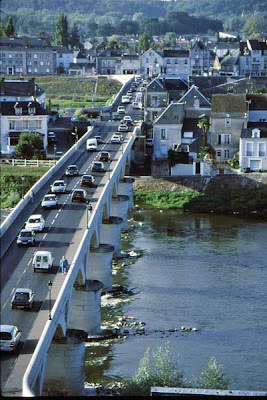 The bridge over the Loire at Amboise. In the center is a small island where there are houses, a hotel, and a few restaurants. 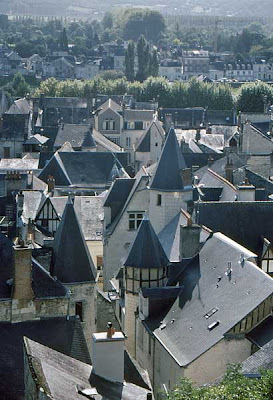 Along with garden terraces and the jewel of a chapel, la Chappelle St.-Hubert, the views from the castle and its grounds of the Loire River valley are spectacular. 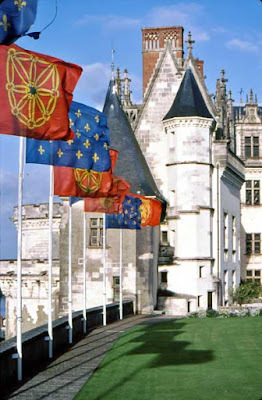 Flags fly in the wind on the now grassy terrace of the château. Of course, the town of Amboise itself is a great place to stroll, shop, and eat. On Fridays and Sundays, the town's outdoor riverside market is a feast of sights and smells. The Friday market is a scaled down version of Sunday's event. I say event because the Sunday market draws great crowds from all over the region and feels more like a fair than a market. Inside the Chapelle St.-Hubert the sun filters through stained glass windows. We now live about a half-hour's drive from Amboise and go over to the market every now and then. We have great markets closer to us but none are as large as the one in Amboise, nor are they in such an amazing setting. There are also a couple of stores we go to once in a while in and around Amboise including a LeClerc supermarket, a great garden center, a couple of ATAC supermarkets, and a produce store. Amboise is a great place to spend a couple of days. I'll post some more images in the coming days. I've been spending a lot of time in the kitchen lately. Before christmas, we found walnuts on sale at a local market and bought four one-kilo bags. Now, what to do with walnuts ? Actually, that's not a hard question at all. My basic pâte brisée, blind-baked and ready to receive the filling. 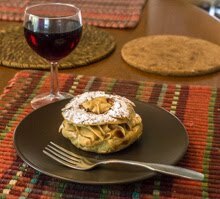 I made a walnut pie, une tarte aux noix, which is a French classic. But I made it with a twist. 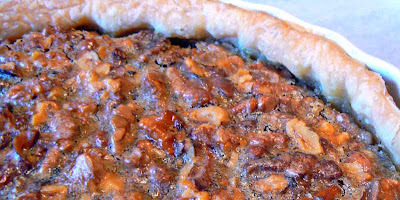 Since Ken is from the south (of the USA, y'all), he grew up eating pecan pie. So I made a pecan pie with walnuts instead. 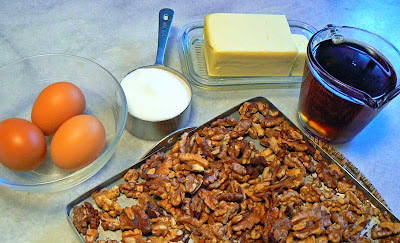 Ingredients assembled for the walnut pie. First, of course, the crust is made and blind-baked. Then the ingredients are assembled. I cracked about 250 grams of walnuts the night before, so they were ready to go. The walnuts are toasted and cooled and lightly chopped. 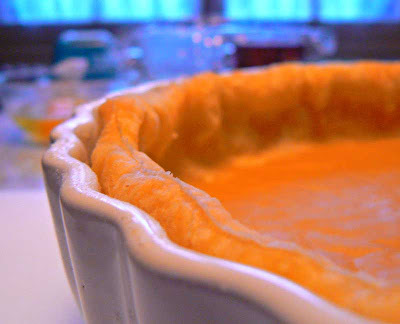 The baked pie cools before serving. Also included are three eggs, 250 ml of maple syrup (imported, of course), about a half cup of granulated sugar, a bit of salt, and four tablespoons of melted butter. 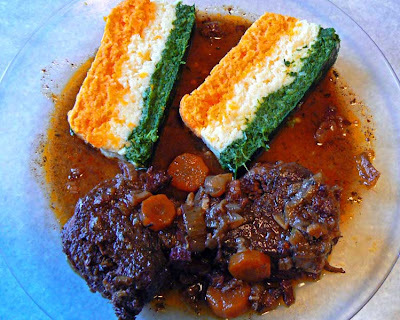 Sorry about the mixed measurements; French recipes tend to use weight measures and American recipes use volume measures for dry ingredients. I was looking at French and American recipes for this pie. 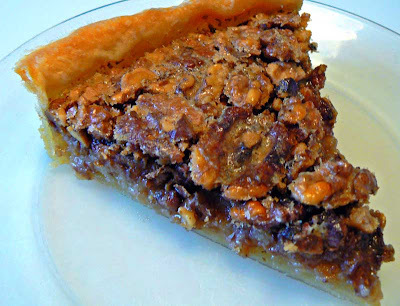 A delectable slice of sweet, nutty goodness. It all gets mixed together, with the nuts, then put into the hot pre-baked shell. Then into the oven until it's done. Serve it cooled or just warm (not hot). And, oh là là, y'all can bet it was some kinda bon ! As usual, I was watching a daily French talk show on tv and one of the guests was a woman named Claire Faÿ. She was hawking her new book entitled, "Cahier de gribouillages pour les adultes qui s'ennuient au bureau." Quite a long title for a book. In the course of the panel discussion it quickly became clear to me what gribouillages are. The little book's title means Doodle Notebook For Adults Who Are Bored At Work. If you look closely at the book's cover, you can see it is published by the PaNaMa company. Gribouillage is synonymous with gribouillis, both serving as the noun form for a scribble or a doodle. 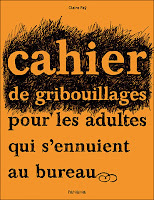 The verb form is gribouiller - have fun conjugating that one; the imperfect of the subjunctive in the first person plural is il a fallu que nous gribouillassions. And yes, I had to look that up. A person who doodles or scribbles is a gribouilleur or gribouilleuse, while a gribouille is a hasty fool, rushing in where angels fear to tread. Be careful not to mix those up ! It never, ever occurred to me what the French word for "doodle" or "scribble" or "scrawl" might be. Now I know ! Yesterday's post was about making fresh pasta, so today's edition of Kitchen Collection will feature the pasta machine. As I said, this manual model was a birthday present from Ken about five or six years ago (or was it longer ?). We remodeled our San Francisco kitchen and had installed a large granite-topped island. 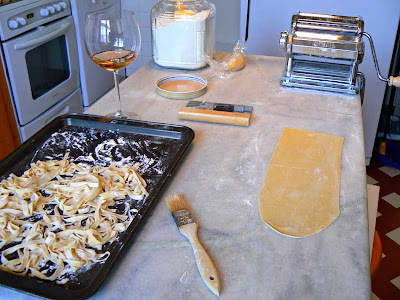 Perfect for making pie crusts and... pasta ! My first attempts were pretty feeble, but perfectly edible. Like with pie crust, practice gives you a better feel for what the dough should be like and how the machine behaves. Yesterday's dough was the best I think I've made. I suspect the reason is that I used the dough hook on the Kitchen Aid to knead the dough rather than doing it by hand. I believe the dough got a better kneading that way - I'm not so patient in the hand-kneading department and tend to stop too soon. Also, I think that letting the dough rest in the fridge helped, too, just like I do when making a pie crust. At any rate, the dough rolled perfectly and cut easily. No sticking, no unevenness. I read on some blogs and forums that people swear by motorized pasta machines. They say it frees up your other hand making it easier to manipulate the pasta sheets. Well, again, I say that practice reveals the best method, and I have no trouble getting into a groove with the hand-crank model. I'm really encouraged to make pasta more often ! Sunday was the day to make fresh pasta to go with the leftover daube de bœuf that Ken made on Friday. 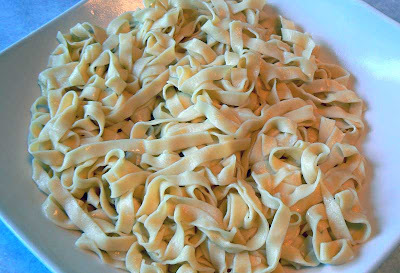 I've made pasta before, but still, I did a little research in our cookbooks and on the 'net. The recipe I used was 3/4 cup flour per egg, and I used two eggs. The pasta making process under way in our kitchen. A glass of rosé is de rigueur. After the pasta was mixed and kneaded, I wrapped it in plastic and let it rest in the refrigerator for about an hour before putting it through the pasta machine. I noticed in my research that some people used their Kitchen Aid mixers to do both the mixing and the kneading, so I tried that for the first time. In the past, I always mixed and kneaded by hand because that's the way the celebrity chefs always said to do it. Fresh tagliatelles just cut from the pasta machine. Well, guess what ? The Kitchen Aid mixed and kneaded the best pasta I've ever made. So there, you celebrity chefs, take that ! Using the Kitchen Aid was much, much easier and that's the way I'll do it from now on. Unfortunately, I didn't take any photos of the mixing and kneading. 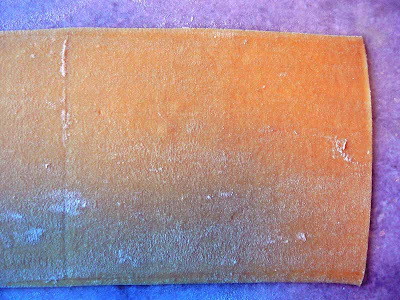 A sheet of pasta ready for cutting. About five years ago Ken gave me the pasta machine that I've been using since then to dabble in fresh pasta. 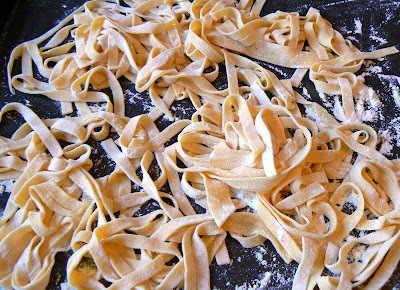 My experience has been that it makes great tagliatelles, and that's about it. I've tried spaghetti and ravioli, but without success. Ken says we should do our own lasagne, and we will try that soon. It's just a matter of cutting the pasta sheets by hand into lasagne instead of using the attachment to make tagliatelles. The cooked tagliatelles just before we served them along side beef stew. At any rate, the pasta was great with the beef stew. You expected less ? The terrine stands alone. Along with a glass of local rosé wine. It was a great success. I say that with all modesty. Really. 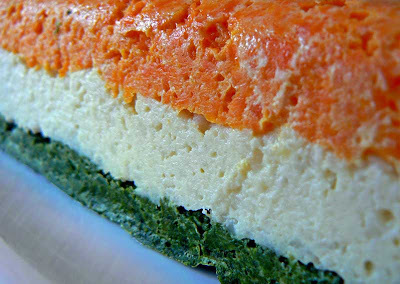 A close-up of the three-color terrine. 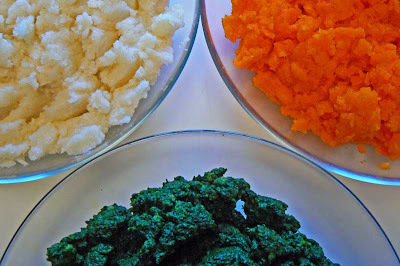 Spinach, cauliflower, and carrots. The terrine un-molded just fine, although a small piece stuck in the pan. It was easily repaired without much fuss. Slices of vegetable terrine on the plate. Then it sliced perfectly and was quite attractive. We plated it with the daube de bœuf that Ken made and we ate it up for our Saturday lunch. It was delicious, if I do say so myself. Our Saturday lunch. Yumm ! Leftovers will be great... We talked about making another with celery root and broccoli. We shall see. Yesterday was the day. 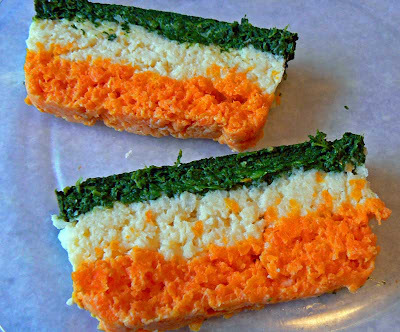 I cooked carrots, cauliflower, and spinach to make the three-color vegetable terrine (terrine de légumes aux trois couleurs) that I talked about on Tuesday. The carrots and cauliflower were fresh, but the spinach was frozen. 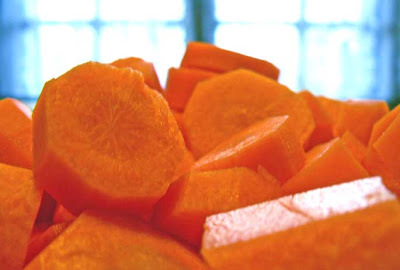 A kilo of carrots, peeled and cut into rounds, waiting to be cooked. After all the vegetables were cooked (separately) and cooled, I put them through the food grinder attachment of the Kitchen Aid mixer. This was definitely more trouble than just whizzing them in the food processor, but I decided that the texture of the ground vegetables would be more agreeable for this kind of dish. I then seasoned each ground vegetable with salt, pepper, and freshly ground nutmeg, then mixed each with eggs and cream. 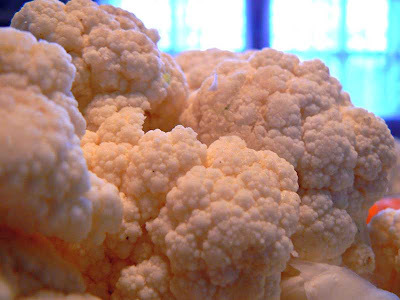 A kilo of trimmed cauliflower awaits its fate. I then layered each of the mixtures into loaf pans that had first been buttered and allowed to chill in the refrigerator. Carrots on the bottom, cauliflower in the middle, and spinach on the top. The three cooked and ground vegetables just before the egg, cream, and seasonings are added. The pans went into a bain marie, or water bath, and into a medium/slow oven for about an hour and ten minutes. The water bath was hot when the terrines when in. 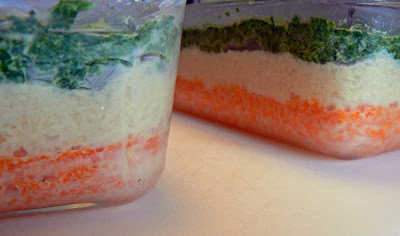 Veggie mixtures are layered into buttered loaf pans before they're cooked in a water bath. 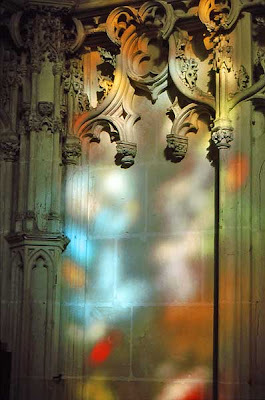 I'm continuing to digitize color slides from the 2000 Loire Valley trip. Here are a few random shots. 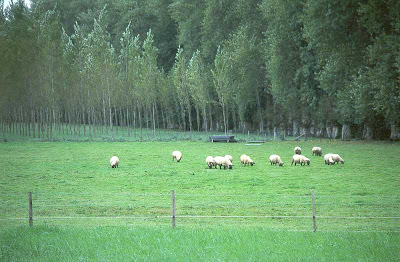 The first (below) is a small flock of sheep that were kept on an impeccably immaculate grazing patch near the Château de Chenonceaux. I don't know if they belong to the château and are there to add some country charm, albeit genteel, to the place, or what. But I think, if memory serves, they were quite near to the parking lot. I found This door and window (below) in the courtyard of out-buildings at the Château de Fougères-sur-Bièvre, an 11th century seigniorie near Blois. The current buildings date from the 15th century. 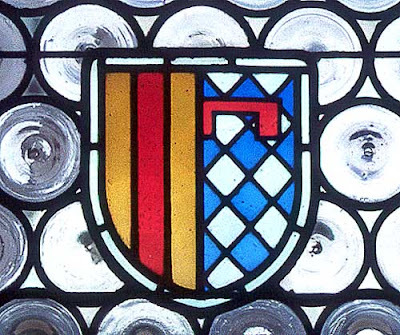 Finally, the stained glass crest inset into the window below can be found inside the Château de Chaumont, which overlooks the Loire river between Blois and Amboise. The castle is famed for having been given to Diane de Poitiers by her rival, Catherine de Médicis (I describe the story briefly here) after the latter kicked the former out of Chenonceaux. As I said, these are just random images. If you want to see more photos of these places, you can click on the "châteaux" or "loire valley" labels in the sidebar to see all my previous posts from those categories. I kind of lost track of the Open Series that I was doing, so I decided to put all the images together into a collage of sorts. These pictures were all taken in Hudson, New York, back in October 2006. The main street of town is lined with art galleries and boutiques these days. It was a gorgeous Sunday afternoon and people were strolling up and down, stopping into shops or just looking at window displays. 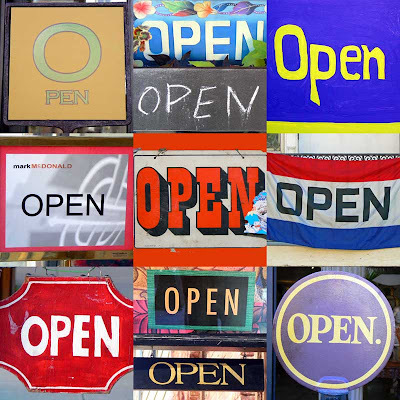 I noticed that many of the signs saying "we're open" were unusual, so I just started snapping. You most often see this word as part of a specific phrase : à l'instar de (quelque chose). It always throws me off because I haven't yet incorporated its meaning into my daily life. While the word/phrase looks and sounds like it should have something to do with technology or science (that's my bias), any student of latin (not moi) would most likely disagree. It means : as an example, in the manner of, almost equal to, or like. 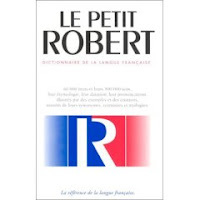 The dictionaries tell me it's not really something you say in spoken French. You see this expression in written French and only hear it if someone is reading aloud or in newscasts (the newscaster is reading the news, after all). Maybe writing this post will help me cement the meaning into my brain ! 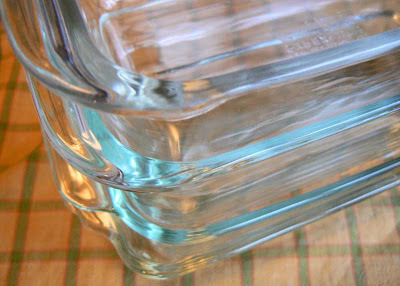 How many glass loaf pans does the well-equipped kitchen need ? Exactly four, and each one should be a slightly different size from the others. It makes things challenging, not the least of which are stacking and storing. Many of my recipes (like zucchini bread) make 2 loaves, so two pans work very well. I don't know how we ended up with four, but we did. I like glass because I can see what's going on inside the pans while they're in the oven, like how brown the loaf is getting. These pans also double as molds for terrines and pâtés. We do have more traditional molds for those things, but a good glass loaf pan fills the bill if you don't have specialized molds. I'm planning on making a vegetable terrine in the coming week. 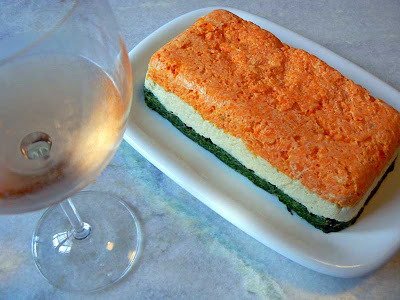 It will be a three-color terrine with spinach, cauliflower, and carrot layers. There will likely be pictures, so stay tuned to see which pans get the job ! The street that went from our gîte down into the village of Vouvray. This will be the last of the Vouvray posts for now. After this we'll move on to something else in the Loire Valley. But still, Vouvray is nice, no ? 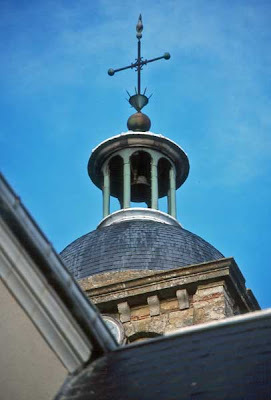 The bell tower of the the Vouvray church. The center of town is down around the level of the river, but there is a part of the town that seems older, that crawls up the bank toward the highlands. It is here where the church sits, looking out over the valley. Its tower is taller than the riverbank it is built into, and can be seen from the vineyard out on the flat plateau above the Loire. 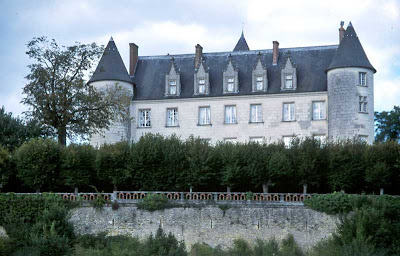 Le Château de Moncontour, on the heights above the Loire in Vouvray. Also built on the the heights is the Château de Moncontour, a winery that produces all the varieties to be found in Vouvray. 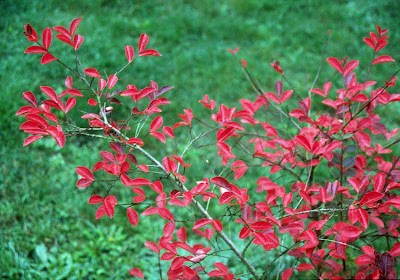 Among them are pétillant, moelleux, demi-sec, and sec. All made from chenin blanc, bien sûr. 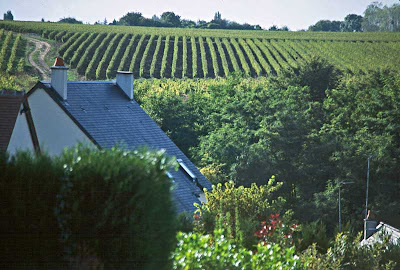 The back of our gîte and the vines of the Château de Moncontour. Our gîte was on the edge of the small village of Vouvray. To the north and west, vines heavy with chenin blanc grapes stretched up the hills. 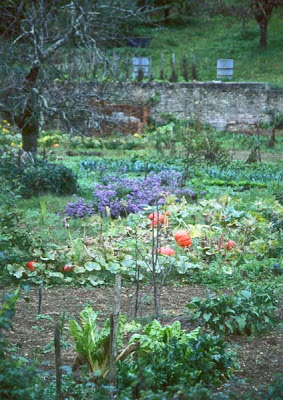 Below us were stone houses with gardens filled with autumn vegetables and flowers. A fall garden with leeks and pumpkins. We had our choice each day : walk among the vines or down into the village. Of course, we more often than not got into the car for a trip to a château or another town in the valley. Each of us had his camera, so there were many stops for that perfect photo. Sue takes prints, I was taking slides at the time, and Ken had already ventured into the realm of digital photography. We found out later that, while we often took pictures of the same thing, each of us saw it just a little bit differently. 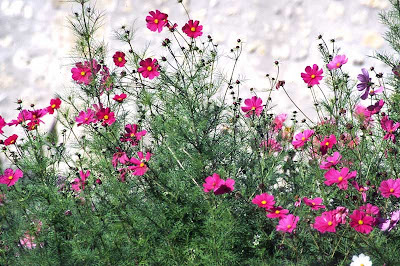 Cosmos against a sunny stone wall.